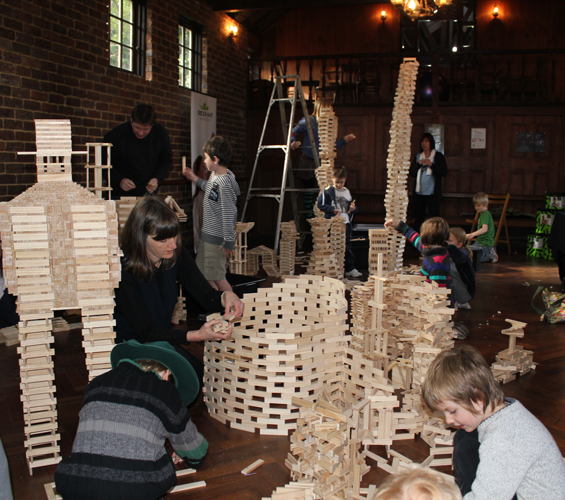 The joy of open ended construction play does not leave us when we mature. The delight in changing and designing the world around us, in experimenting with shape and balance is constant at every age. 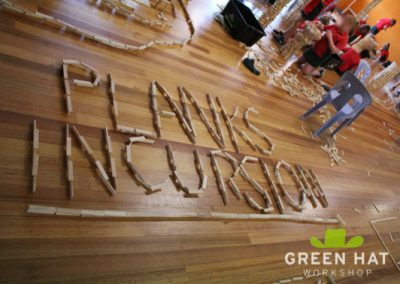 Green Hat Workshop’s PLANKS incursions are easy to arrange, engaging for your community or event and come to the venue of your choosing with minimal fuss. 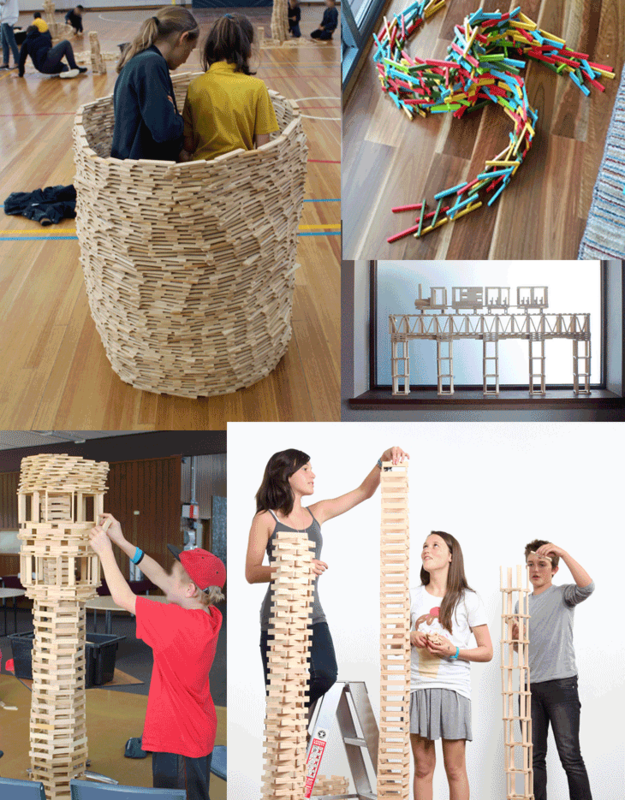 The flexibility of our PLANKS’ rectangular prism shape and Green Hat Workshop’s philosophy of self directed, play-based learning, provides opportunities for all abilities to participate and to challenge themselves at their own level, enabling participants to simply stack towers of impressive height or to create sophisticated cantilever bridges, 3D shapes and more. 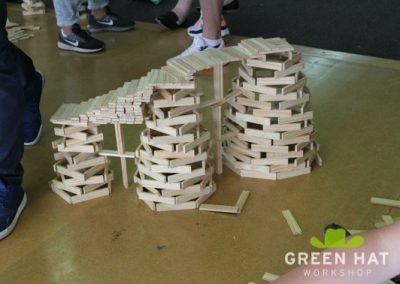 Green Hat PLANKS Workshops offer an abundance of PLANKS, promoting the opportunity to share and celebrate diverse expressions of creativity, Mathematics, Engineering, interpersonal skills and resilience. 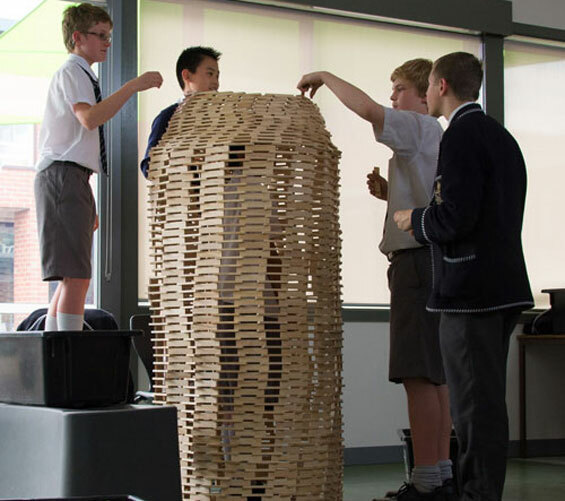 PLANKS are dynamic building blocks designed to inspire creative minds. Identical in size and shape, and cut precisely from 100% New Zealand plantation pine, PLANKS are specifically proportioned so that,with the help of gravity and a little imagination, you can build, boats, castles, animals and robots… or even a spiralling staircase to the moon. Totally inclusive, PLANKS encourage a wonderful mix of creativity and skill, social development and imagination. 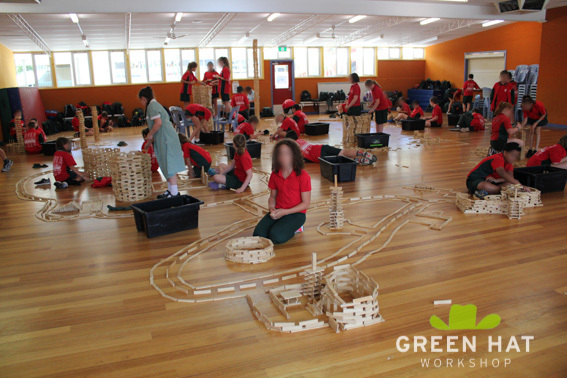 Green Hat Workshop’s multi-ability play-based incursion program has been used in a wide range of in-school, after-school, curriculum linked and social activities in educational spaces around Victoria. The workshop’s popularity with students, teachers and parents has lead to strong and ongoing relationships with many educational communities. The physical and mental engagement of participants in a PLANKS workshop is a welcome creative event for OSH club attendees and staff during busy school curriculum days and holiday programs. 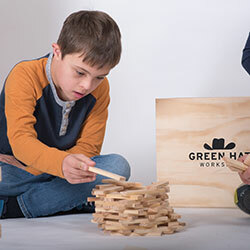 As we cater for up to 100 participants at once and the activity needs very little explanation, several larger holiday programs enjoy Green Hat PLANKS Workshops in their regular programs. As a public library family activity, or a rainy day or evening activity for a school or charity camp, a PLANKS workshop adds a memorable and authentic community experience. PLANKS are a true multi-age, multi-ability activity and are more than just a child’s toy; PLANKS engage everyone. 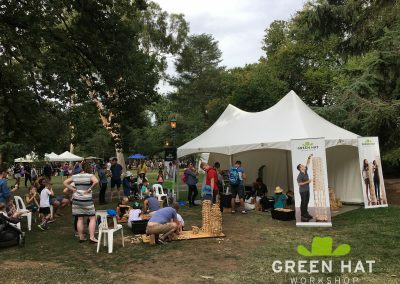 Since Green Hat Workshop’s inception we have worked hard to provide opportunities for our Builder Community to get together and enjoy our 25,000 PLANKS collection. 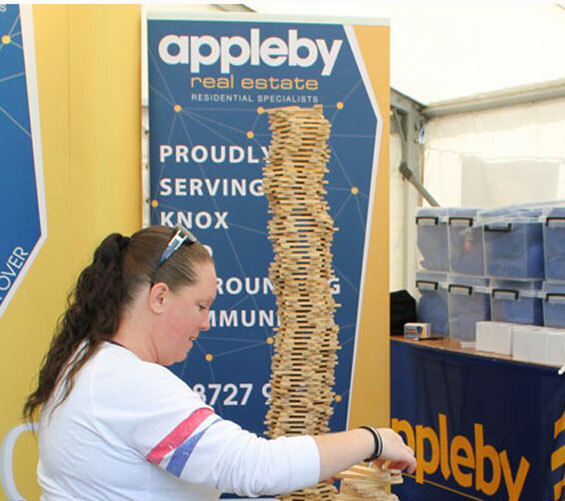 Appearing at several of Warrnambool’s Fun4Kids Festivals, Arts and Local Council Festivals as well as Agricultural Shows and Designer Markets both local and interstate, PLANKS are always popular and even rival traditional candy floss and carnival rides for engagement. While we do not run children’s birthday parties, a PLANKS workshop can be a fun and inclusive addition to a large Family event or milestone celebration. Frequently called upon to provide engagement with prospective leads or as a fun draw-card to a promotional event, Green Hat Workshop have been employed by several Victorian Local Councils and by both Mirvac developers and Appleby Real Estate Agents, to engage passer-by at local festivals and by LendLease Group, as a “constructive” amusement for publicity events. Images of these events HERE. 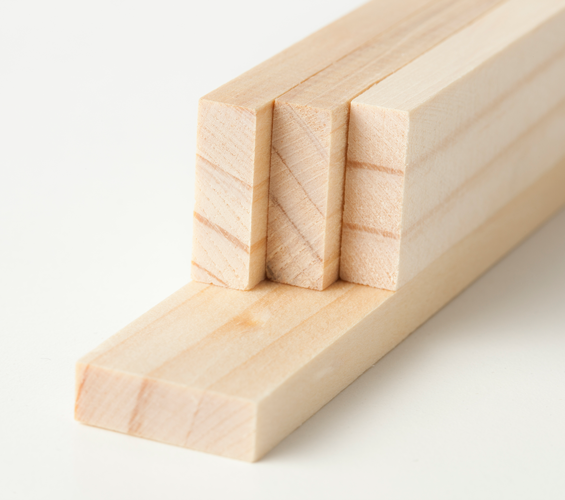 Due to the “component” nature of PLANKS, the creation of larger constructions in a limited time is an effective method of drawing people together – The more competitive, the stronger the need to compromise and negotiate. In this way a PLANKS workshop intrinsically drives participants to achieve their goals by working cooperatively. In a team building setting a PLANKS challenge is a useful experience to help teams reflect on their dynamics and interpersonal skills as well as an opener for discussion about project ownership and job briefing. In partnership with a range of workplace H.R. 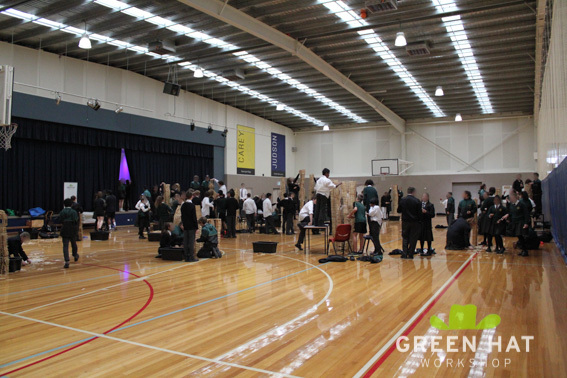 managers and private contractors, Green Hat Workshop have provided conference ice-breakers and a range of team challenges for fun and to illustrate dynamics within a group. 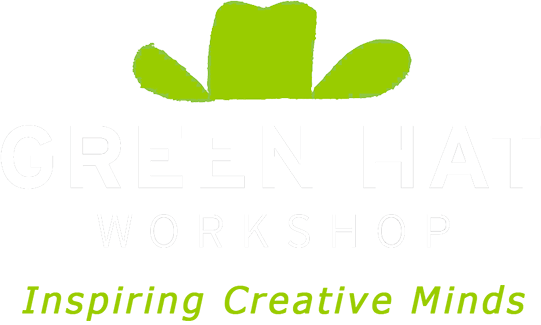 Green Hat Workshop welcomes sub-contract and partnership arrangements. The Green Hat Workshop Team of Facilitators are open to all manner of workshops for different purposes and work hard to personalise their presentation, timing and format to the needs of the participants in front of them at each event, rather than strictly keeping to a set plan. The most valuable aspect of each workshop is the period of time where participants are engaged in free open ended play. During this time our Facilitators work hard to open up the potential learning in the activity through demonstration, question and prompted reflection. Following are the focus and design of some of the workshops we have facilitated. 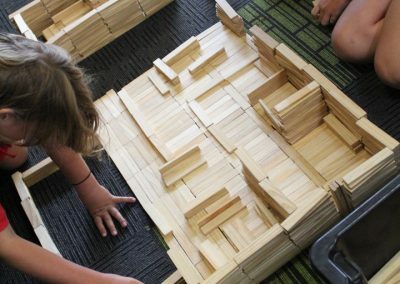 A series of workshops from after morning play, then an hour and a half open play workshop in the evening with parents; sometimes with a presentation introduction or conclusive reflection that outlines the value of open ended block play in Mathematical Development. 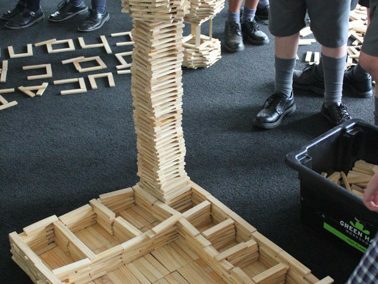 Introduction and examples, warm up challenges, Free build, Reflection, Clean up. 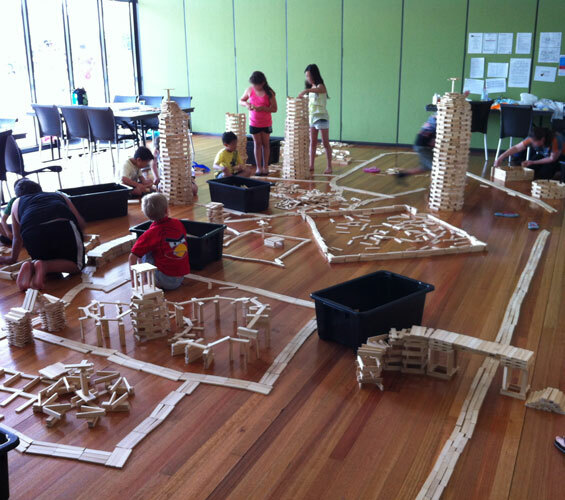 A PLANKS workshop as part of a series of Mathematical Activities. Book through MAV. 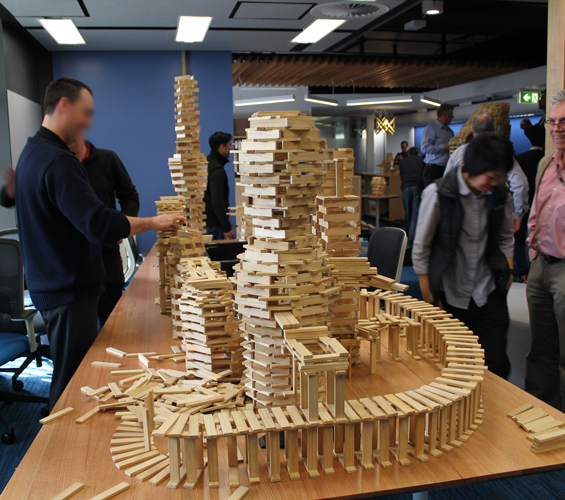 – A full day of city and infrastructure design with a final city building workshop. 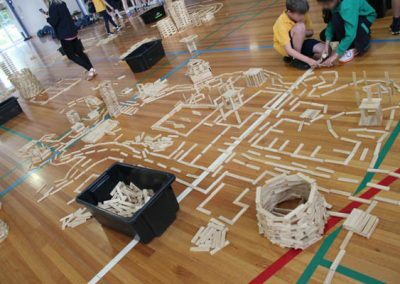 – A conclusion to a unit of work on geography and history using the PLANKS to recreate famous historical buildings and land-marks from around the world. Short intro and long build. Just for fun.. and education. Often at the end of the school year, at a school celebration, camp or special day. Our facilitators prefer longer periods of time with more participants. Optimum time frames are 1.5 to 2 hours for a workshop with up to 100 participants. We understand however that timetables are often quite inflexible and we regulary compromise in this regard. We hope that teachers consider booking workshops for two days over the decision to compress a workshop into an hour, as the authentic, self-driected learning of the workshop is reduced. Foundation and Grade 1 students is optimally 1-1.5 hours. $700 for a full day. 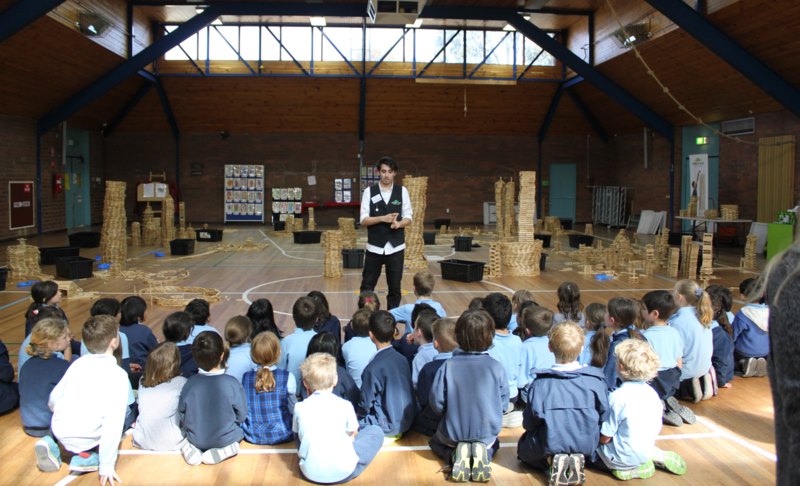 While we tailor our PLANKS Workshops to suit your school, it is generally understood that a day’s workshop is for multiple groups rather one group for a full day. Multiple setups are charged as separate workshops. *A Travel Levy applies outside Melbourne Metropolitan area, excluding “City Visits” to locations greater than 2 hours drive from Melbourne. Workshops cater for up to 100 participants. Numbers greater than this carry an additional cost of $7 per head per session. Prices may vary. Please consult a direct quote from Green Hat Workshop. The most appropriate building surface is a flat, even, indoor one, with trolley access and large enough to contain 50cm2 or more for each participant. This activity is not run within multiple spaces but takes place in a single location per booking. Multiple locations are viewed as multiple bookings and will be billed accordingly. Access is required up to an hour prior to the workshop; shorter setup times are negotiable but may impact on the workshop. 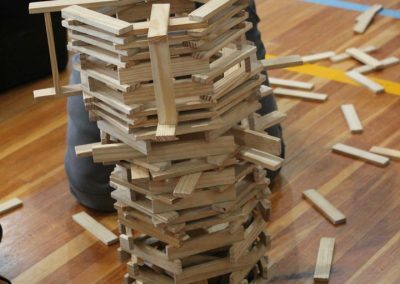 Our PLANKS incursions in kindergartens are often prompted by a group of super-builders who will stack and design with anything that is not nailed down. 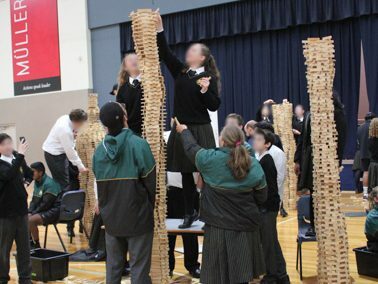 In this instance our incursions are an event in celebration of this creativity and often begin with a whole group and finish only with these dedicated engineers. 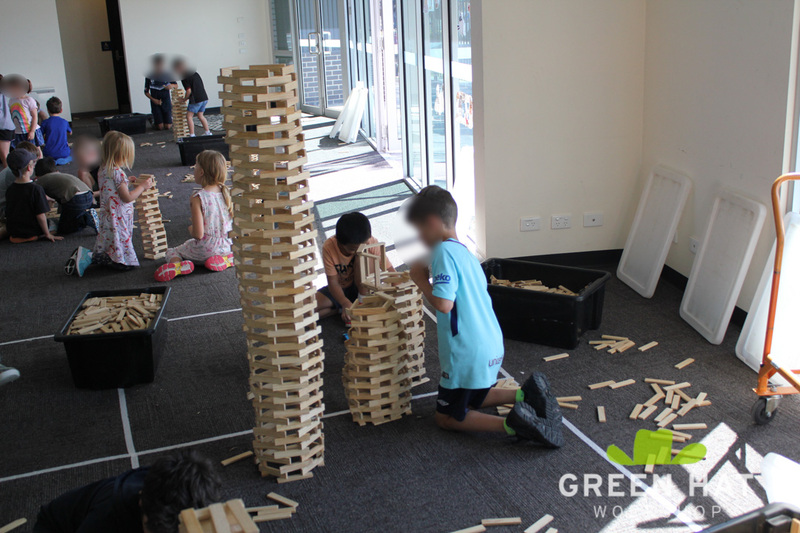 A PLANKS incursion can elevate construction in your room and provide the children (especially the engineers of the group) with a lot of possibilities for their block play, sometimes creating an almost ecstatic atmosphere. 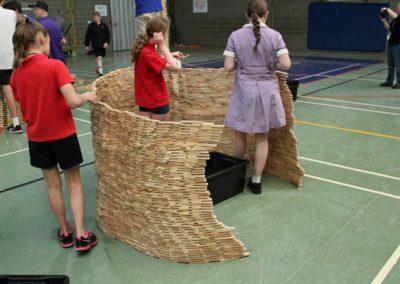 We do however suggest that the purchase of a box of PLANKS is more cost effective for early years services, over the investment in an incursion. 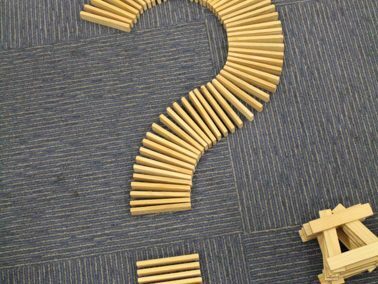 We suggest this because purchased PLANKS enrich your ongoing play provision rather than potentially creating an expectation that children need to engage with a single activity over an extended period of time. Developmentally speaking, and as a generalisation, many of these children will probably spend about 40 minutes playing with the PLANKS and then look for the sand-pit or the painting easels, as this is the natural ‘cadence’ of their play cycle. We prefer to work within this natural cycle rather than imposing ourselves on top of it. I hope that knowing these are our values that we are able to tailor an incursion that is most suitable for your service. We also love Kindergarten Parents’ Evenings and some of our most memorable experiences have been facilitating authentic play between parent and child. Cam (our Education Manager) is also available for parent’s afternoons/evenings and also has experience running father’s evening discussions on what play is, how to support it and how best to play with your child. This is followed by a period of play and discussion. A father himself and experienced educator, Cam facilitates topics of discussion while the minds of those in attendance are partialy focussed on PLANKS construction. The open ended nature of Green Hat Planks Workshops are one of a rare type of incursion which produces a challenging and creative atmosphere for every ability*. PLANKS are intrinsically engaging for every participant at their optimum competence, without measurement, formal rules or external expectations. They can be positioned, stacked and balanced in as many ways as there are builders and the component nature of Planks means that repetitive stacking or patterning leads to outcomes that are just as exciting as more sophisticated engineering. While our facilitators are not formally trained in special needs education, our partnership with many specialist groups and schools has led to some of our most memorable work. 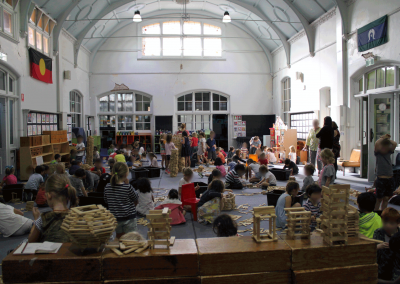 We regularly receive feedback from specialist aides and Primary School Classroom Teachers that exceptional social development occurs during PLANKS play, with ALL of their students. As our Facilitators work with an understanding of Piaget’s Constructivist theories of cognitive development and Green Hat Workshop’s core value of working with the people in front of us, rather than to a “turn-key” preprepared plan, we are highly adaptable to the communities we work within. 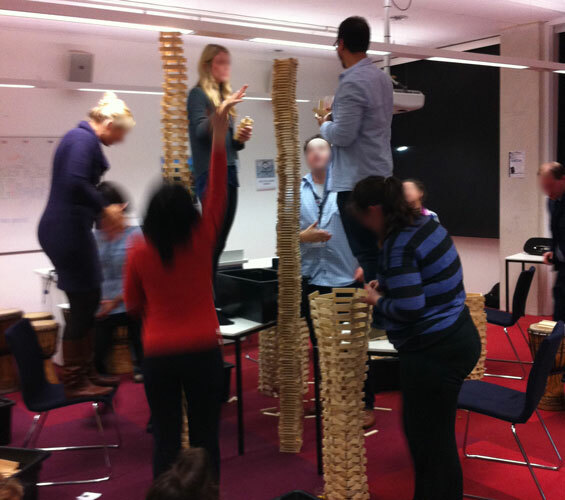 *Participants need to have basic finger and arm dexterity, be able to physically hold, grasp and stack. The PLAY REPUBLIC appears at local parks and city centres Australia-wide. 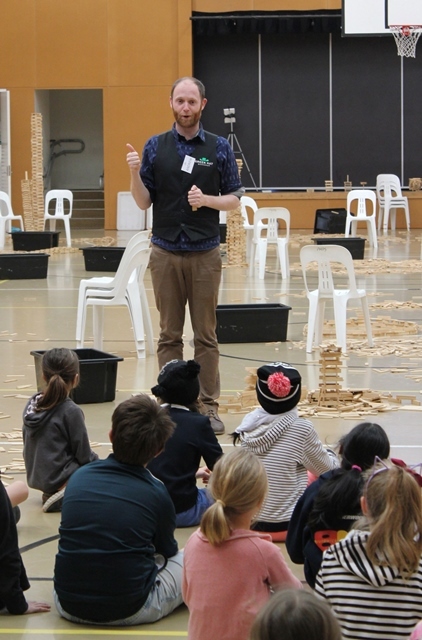 Green Hat Workshop’s PLAY REPUBLIC is a collection of our best creative activities with our PARTS program at its core. Including all relevant due-diligence, insurance and staffing, The PLAY REPUBLIC seeks to provide an all inclusive self-directed play experience in public spaces and at events nation-wide. Our team of trained facilitators practice within a Playworker influenced philosophy to provide a space where children can be themselves and engage in “deep play” of a type that is developmental, social and creative in nature. We believe this work to be the most valuable contribution that we make to Australian society. Presented in a growing number of school communities by STEAM & Mathematics Specialists, Student Well-being Officers, School Leadership Teams and Classroom Teachers. Presented by city councils, renewal authorities, arts councils, festival organisers, corporations, marketing & promotional companies, property developers and estate agents.